A reader posed a question about my recommending the use of a pesticide for aphids in an earlier article that brings up two separate and subsequent issues: beneficial insects and beneficial plants. 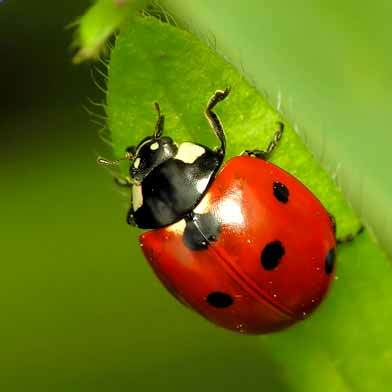 Beneficial insects range from store bought ladybugs and lacewing larvae to homegrown spiders and salamanders. To attract homegrown bugs you need food for them, or pests. I once saw a bunch of ladybug larvae on the backs of strawberry leaves infested with aphids. (Ladybug larvae are black with a yellow stripe down the center, I suggest using “Google images” if you’re not sure what they are.) These ladybug larvae decimated all the aphids in that 3 foot by 3 foot patch of strawberries in a couple of days leaving me with clean, aphid free plants for free! I have tried purchasing beneficials with limited success. One year I experimented with every beneficial bug I could purchase on a particularly aggressive case of potato aphids attacking tomatoes in my greenhouse. Not only do the words potato and tomato rhyme, but these crops are in the same family, and share many of the same pests and diseases including the potato aphid. I figured my greenhouse would be an excellent controlled environment for this experiment. I bought two canisters of ladybugs and released the first canister all over my tomato plants all at once. They immediately escaped through whatever cracks they could find (like I try and do when I visit my in-laws), and were gone the following morning, leaving me with lots and lots of healthy, succulent aphids. Not one lady bug remained. I released the second canister more slowly over the course of the next couple of days along the ground underneath my tomato plants, hopeful that this time they might climb up the plants on their way to freedom and encounter a few aphids along the way. This method worked better. A few, and I literally mean three ladybugs stayed put and ate aphids for a couple of days before flying off as well. I got lucky though, one ladybug laid eggs on a bush beefsteak tomato and once again I witnessed ladybug larvae do their thing. Desperate for better success I ran to the nursery and tried two other readily available insects for purchase; lacewing larvae and a prying mantis egg. I cannot speak more highly of lacewings! I was able to release larvae directly to the infested areas without fear of a winged departure as rapid and regular as SFO on a clear day, and it worked. The lacewings ate each and every aphid, completely cleaning off all the leaves and liberating my tomatoes. It was quite an exhilarating thing to watch!!! That being said, and to bring this conversation full circle I will always and immediately spray any aphids in my yard using the previously recommended “Orchard Spray”. I simply don’t risk crop failure when there is a very effective and readily available product, sold in a economically savvy concentrate, that is easy to apply and safe to use even on the day of harvest. I also immediately squash with my hands or feet, sow bugs or “rolly pollies”, earwigs or “pincer bugs”, snails, slugs and caterpillars. Make sure they are dead before moving on as snails and slugs are quite resilient, and make this a routine part of your pest management. Oh, about that praying mantis egg. Four hatched and began to eat everything in sight including aphids and lacewings. It was really cool to watch, and I recommend them if you have kids! Quick Tip 1: if you see a white moth fluttering around your broccoli or cabbage plants be sure to catch it or shoo it away as it is looking to lay eggs which will hatch into caterpillars that will eat your leaves very fast. Quick Tip 2: Leave small spider webs in your tomatoes. They will capture and eat aphid flies and various moths looking to lay pest eggs. Quick Tip 3: Healthy plants grow in healthy soil, and are better able to fend off insect attacks until either I get there or a predatory insect does. I cannot emphasize this enough, amend your soil at least once a year using organic compost. Over time everything will begin to flourish when your soil is rich. The aforementioned reader also inquired about plants which can attract beneficial insects, which I’ll tell you about in a future article. Until then, check out this piece on Spots Unknown on the work Peter Vaernet has done at Brooks Park, a project that’s close to my heart, as you’ll see in the video.